We’re expecting more snow this weekend. What’s better than a mug of great hot chocolate on a snow day? I’ve been working on my own hot chocolate recipe for a while, and it’s finally time to share it. 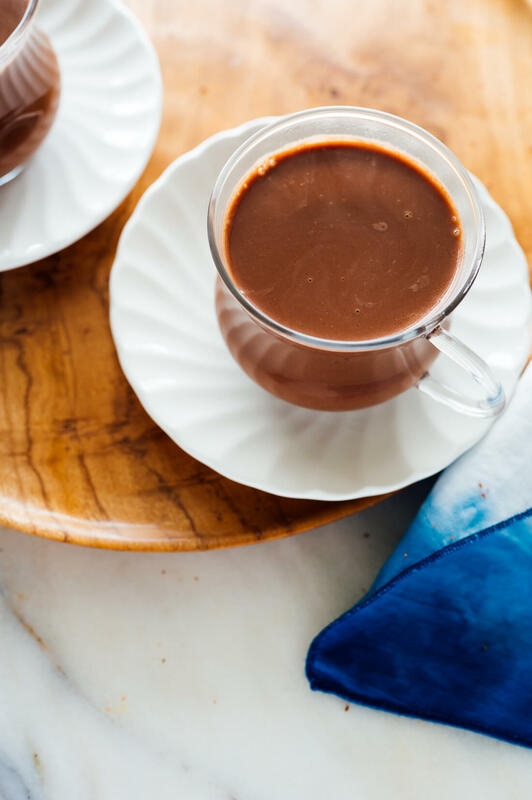 This hot chocolate recipe is made with wholesome ingredients and tastes more grown-up than the packets of hot chocolate I loved as a kid. It’s rich and complex, but not so decadent that I can’t finish the cup. 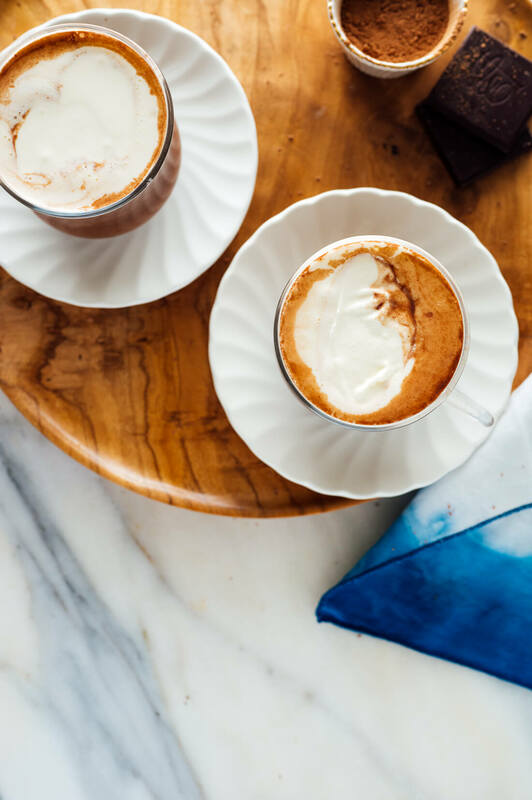 Whether you’re warming up on the couch or hosting a hot chocolate bar for your friends (check out the variations offered below), I think you’re going to love it. My favorite hot chocolate is a hybrid between “hot cocoa” (made with cocoa powder, which yields a lighter result since the rich cocoa butter has been removed from the cacao beans) and “hot chocolate” (which is richer since it’s made with chocolate bars, containing cocoa, sugar and rich cocoa butter). The combination of the two produces a seriously delicious hot chocolate with deep chocolate flavor. You can control the intensity of the chocolate flavor by your choice of cocoa powder and, more importantly, your choice of chocolate. I love dark chocolate so that’s what I used. Milk of choice: You can use traditional cows’ milk (whole milk) or plant-based milk (cashew milk, etc.). This will come as no surprise but thicker, creamier milks produce thicker, creamier hot chocolate. You’ll find more notes on milk options under the recipe. 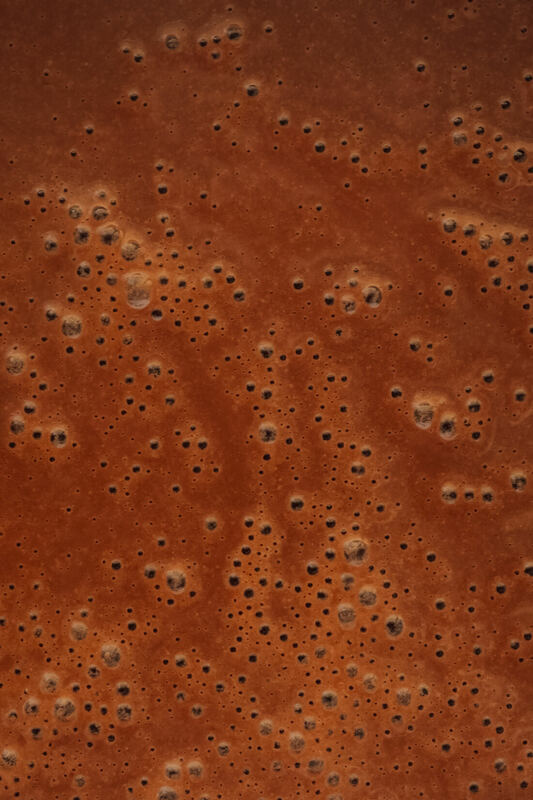 Cocoa powder: This is the base of your chocolate flavor. Use a good one! I used Trader Joe’s but you can get fancier if you’d like (I love Lake Champlain). Dutch-processed cocoa powder will produce a smoother, less acidic result, but regular cocoa powder works as well. Maple syrup: I like to sweeten my hot chocolate with real maple syrup instead of sugar. Since it’s in liquid form already, it whisks right in. It adds a very subtle layer of extra flavor, too. While there is regular sugar in chocolate bars or chips (more or less depending on your chocolate strength), I like using a natural sweetener to make up the difference. 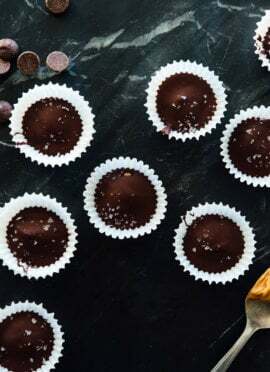 Chopped chocolate or chocolate chips: This doubles the chocolate flavor and makes the drink more creamy, thanks to the cocoa butter content. Choose milk chocolate or dark chocolate, depending on the intensity desired. 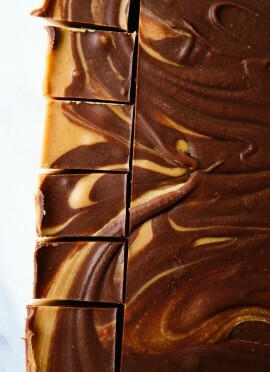 I love dark chocolate so I used Theo’s 70% dark chocolate baking bar (bought at Whole Foods). You can also use chocolate chips; I recommend using a quality brand for best results (Ghirardelli is better than Nestle, for example). Vanilla extract: Vanilla adds greater depth of flavor. 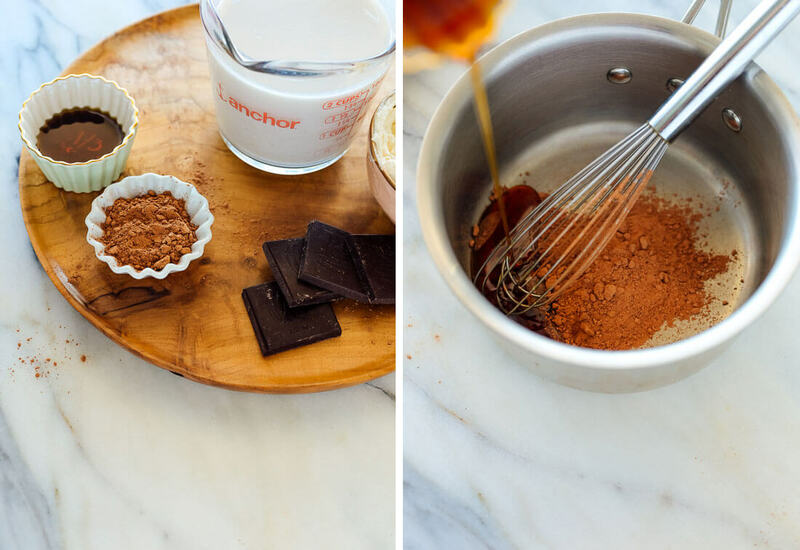 In a saucepan, you’ll stir together the maple syrup and cocoa powder until combined. Add the milk and bring the mixture to a gentle simmer. Don’t let it come to a full boil, or you could scald the milk. Remove the pot from the heat and stir in the chopped chocolate (or chocolate chips) and vanilla extract. Mexican hot chocolate: Stir a pinch of ground cinnamon into your cup. Cinnamon stick garnish optional. Peppermint hot chocolate: Add a drop (really, just one drop) of peppermint flavor (affiliate link) into your cup. Spike it: A splash of bourbon or spiced rum would be quite nice. 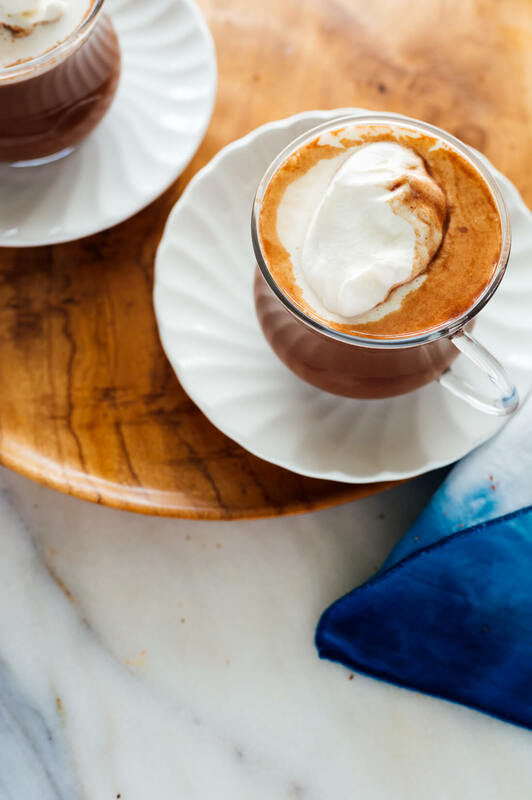 Please let me know how you like this hot chocolate in the comments! I love hearing from you. Craving more warm drinks? Warm up with a hot toddy, Irish coffee or pumpkin chai latte. 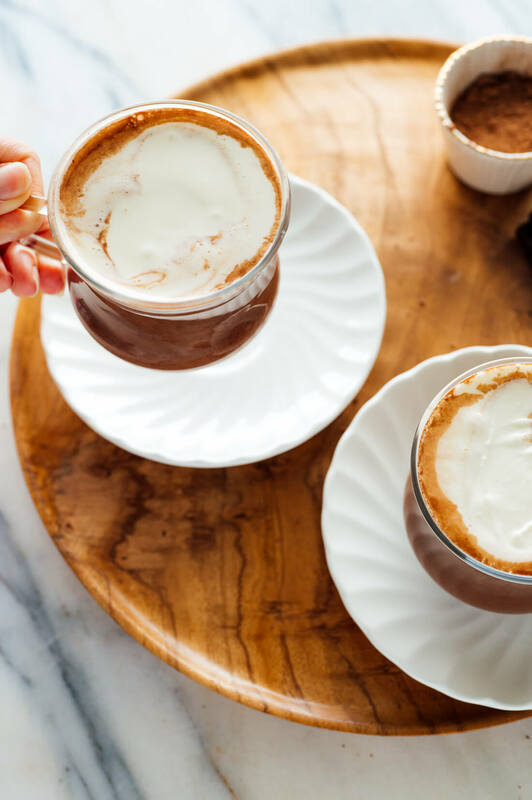 Warm up with this delicious hot chocolate recipe! It’s made with cocoa powder, real chocolate, your milk of choice and a drizzle of maple syrup. Recipe yields 2 cups; divide or multiply as desired. In a medium saucepan, whisk together the cocoa powder and 1 tablespoon maple syrup until the cocoa powder is mostly incorporated. Whisk in the milk. Warm the mixture over medium heat, stirring frequently, until it comes to a gentle simmer, about 4 to 7 minutes (don’t let it come to a rolling boil). 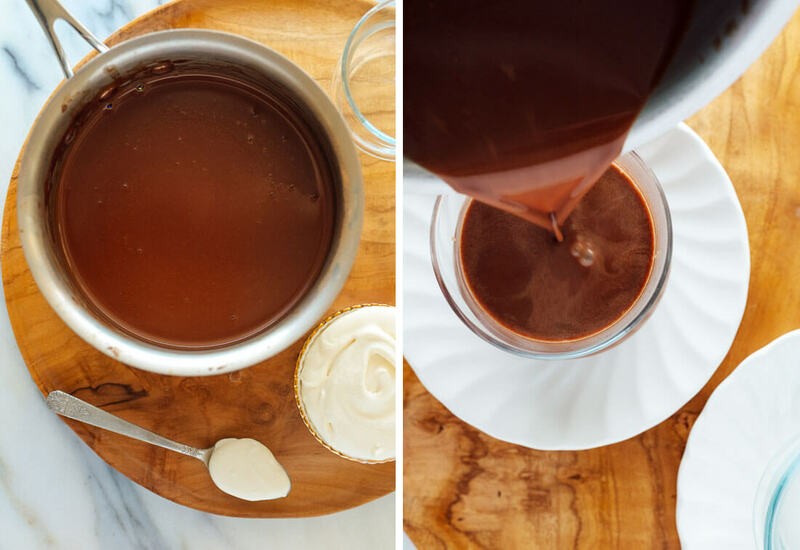 Remove the hot chocolate from the heat and stir in the chopped chocolate and vanilla extract until well blended. Taste (careful, it’s hot), and add more maple syrup if you’d like a sweeter cup. Pour the hot chocolate into two mugs, top with any desired garnishes, and serve while hot. *Milk suggestions: Thicker, richer milks produce better hot chocolate (think whole milk). Good plant-based options include homemade cashew milk or store-bought cashew milk (I like Forager brand). Three Trees and Malk make creamy almond milks. Light coconut milk would be nice. Oat milk thickens too much when heated, so I don’t recommend it. Cocoa powder notes: Regular or Dutch-processed cocoa powder will work well. Dutch-processed offers less acidic chocolate flavor, so if you have them both to choose from, I’d pick Dutch. Make it dairy free/vegan: Use plant-based milk (see suggestions above) and choose dairy-free/vegan-friendly toppings. Oops! Thank you for pointing that out, Giselle. I’ve edited the post. I initially suggested regular only because that’s what I used, but after further investigation Dutch might even be a better choice. I bet Guittard would be awesome. I want to say this would work in a slow cooker, but I haven’t tried to be sure—I’m not sure if prolonged heat would effect the chocolate or not. Please report back if you try it! I agree with Giselle — Guittard has excellent products — Fair Trade too! 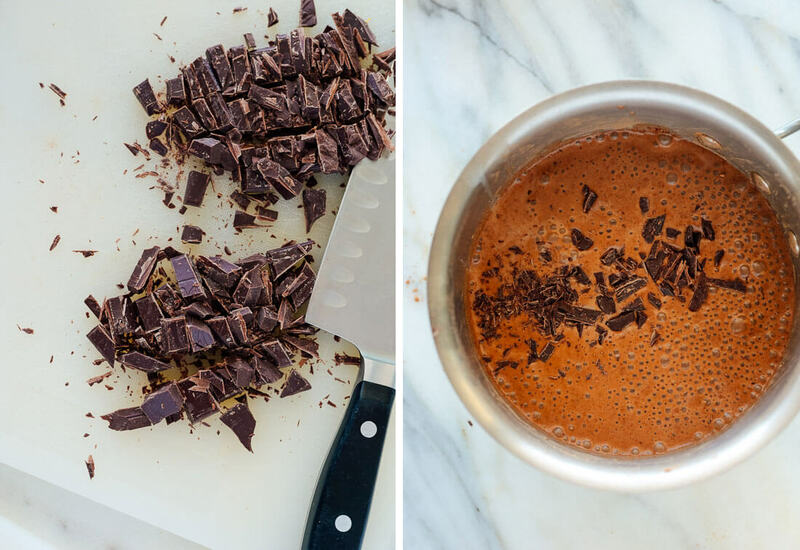 Trader Joe’s cacao powder is Fair Trade as well — would that work in this recipe? I had *no* idea there was a difference between hot cocoa and hot chocolate! Mind blown! This recipe looks great (your photos are lovely! )… can’t wait to try it out! Right! Let me know what you think! Wow! 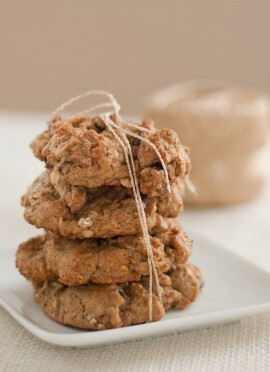 I will Be making this today. . All I have on hand is unsweetened vanilla almond milk. Do you think that would work? Loving your recipes. Stay warm today. Thanks. Yes, that will work! It won’t be as thick as it could be (not a deal breaker) and you might not want to add the remaining tablespoon of maple syrup since it’s already sweetened. You might want to adjust your vanilla since it already has it in it. Let me know what you think, Traci! My wife, Ofelia, is from Philippines. She makes a hot chocolate from beans grown in that country. It is so rich and yummy …. but this looks, delish. and shall show Ofelia later to compare. I just made this hot chocolate in a mason jar. I put the mason jar in the pot of water. It acts as a double broiler. I put all the ingredients in the mason jar and stir until it reach 155 degree F. Once it is done, I transferred the hot chocolate in a mug. It was very delicious. Great to hear, Celina! I’m glad you loved it. Sounds delicious but I would up the anti with a healthier option of real cacoa powder or paste. Delicious! Would use less maple syrup next time! I’ve never thought of adding maple syrup to hot chocolate before; it sounds delicious! What are the proportions of the ingredients per one serving? Did o miss this? Never mind! I see the proportions now when I clicked on the actual recipe. Sorry, new to your blog! I made this vegan with almond milk and some chocolate I already had, I can imagine it is even more delicious with milk. I opted for the extra maple syrup since I’m used to nestle hot chocolate sweetness. Will definitely make again and maybe try with milk and better chocolate! Lovely, Stacey! Thanks for sharing. Mhmmm, hot chocolate is the best this time of year (even though there’s no snow in Cali)! You’re welcome! Let me know what you think, Luana! Simple but fabulous! It makes my day :) Hot chocolate is perfect drink for this cold weather. The perfect for cold weather! Thanks for your review, Ethel. This was sooo good, Kate! I think the chopped baking chocolate really “makes it”. The thick, creamy texture is wonderful. (I used whole milk). I would say it’s a hit! Snow and hot chocolate. I love it, Amy! This was delicious and so lovely on this cold wintry day, finally got the hot chocolate I craved from my favorite restaurant at home! and this tasted better. I followed the instructions as written. Thank you! How fun! I’m glad it was even better than your favorite restaurant quality. Thanks so much for you review! Can this be made and then reheated later? This is really best served immediately. I love homemade hot chocolate, and I’m surprised how many people are surprised when I tell them how to make it: chocolate + milk + heat. I suggest an addition of a tiny pinch of salt. My favorite flavoring is a dash of cinnamon and the tiniest shaving of whole nutmeg. I really appreciate the way you added Choco-chips in finishing step. The way you contribute the hot chocolate its appreciated. Thanks a lot for sharing it with us..
What an amazing recipe…my child will gonna love it..